Trevarrick Bed and Breakfasts. Compare latest rates and Live availability for all your favourite places and places you have always wanted to go using our new My Shortlist feature. Click + to add to your Shortlist. Bed and Breakfasts in Trevarrick, Cornwall for 1 night from Sat Apr 20, 2019 to Sun Apr 21, 2019 within 10 miles, in an Average Nightly price range of £1 to £200. Enjoying panoramic sea views, the Mevagissey Bay Hotel offers relaxing accommodation on the south coast of Cornwall. Around 9 miles from the Eden Project, this hotel provides free parking and Wi-Fi access. All rooms have a TV, hairdryer and tea and coffee facilities. Each has an en suite shower room with complementary toiletries. Many rooms have a sea view while some look out over the gardens. Breakfast is made with local produce and served each morning. The hotel has its own bar serving fine Cornish ales and ciders. There is also a lounge with warming log-burner. The picturesque harbour of Mevagissey is a short walk from the hotel, and just over 6 miles from the area's largest town St Austell. Truro is around 35 minutes' drive, with Newquay on the northern coast about 45 minutes away. Set in 3 acres of grounds, Boscundle Manor boasts a heated indoor swimming pool, an award-winning restaurant, and a spa. Just 1 mile from The Eden Project, the property also offers free parking and free WiFi. Boscundle Restaurant serves a seasonal menu and homemade specialities using local produce. The candlelit restaurant features real silver cutlery, elegant glassware and fresh flowers. The Boscundle Manor Hotel has terraced gardens, woodlands and a croquet lawn. The Zento Spa has 2 swimming pools and a hot tub. Guets can also enjoy a conservatory and lounge with a DVD collection and library. Just 5 minutes from St Austell, Boscundle is a 10-minute walk from Pinetum Park. The Lost Gardens of Heligan can be reached in 20 minutes' drive, and Charlestown is just 1.5 miles from the hotel. Set 2.4 km from the beach in Portholland on the Roseland Heritage Coast, Tubbs Mill House B&B boasts air-conditioned rooms with free WiFi throughout the property. Free private parking is available on site. Caerhays Castle is 3.2 km away. Every room comes with a flat-screen TV and DVD player. Certain rooms feature a seating area where you can relax. For your comfort, you will find bathrobes, a hairdryer and free toiletries. You will find a shared lounge at the property. A home-cooked two-course evening meal can be provided upon prior arrangement. The property uses locally-sourced produce. Gorran Haven and Mevagissey are both a 12-minute drive from Tubbs Mill House B&B, while St Austell is 20 minutes by car. The nearest airport is Newquay Cornwall Airport, 32.5 km away. Just seconds from the seafront, Rashleigh Arms is situated in the pretty fishing village of Charlestown. With wonderful views and free parking, there is also an on-site restaurant. The Rashleigh Arms is a traditional English pub, offering rooms with en suite bathrooms and tea and coffee facilities. Some rooms have views across the English Channel, and all are stylishly decorated with colourful bedspreads. The popular restaurant serves fresh fish and local produce, and a full English breakfast is available each morning. The lively bar serves a world wine list and a selection of local award-winning ales, and hosts regular live music nights. There is also a terrace for al fresco dining. Just 5 minutes' drive from St Austell town centre, The Rashleigh Arms overlooks the sea and Charlestown Quay. St Austell Brewery is a 10-minute drive away, offering guided tours and an interactive museum. The Eden Project can be reached in just 10 minutes. A large elevated modern house with views of the sea & harbour in the popular old fishing village of Mevagissey. Furnished & decorated to a very high standard it offers excellent accommodation at a very reasonable cost. Close to Heligan. Check in from 2pm unless by prior arrangment. Traditional Cornish Inn with 5 letting rooms serving local real ales locally sourced home cooked food and set near Heligan Gardens and the Eden Project. In the heart of the picturesque village of Veryan famous for the Roundhouses on Roseland Peninsula is Elerkey Guest House a delightful family run country house set in its own beautiful grounds with patio area lawns and ample off road parking. br / br / We are approx one mile from beaches and coast paths. Eden Project National Trust properties and Heligan are close by. br / br / Elerkey offers AA Rated En-suite B & B where hospitality and service are exemplary. We also have an art gallery where Harvey sells his original paintings and prints along with hand-made Jewellery cards and gifts. The coffee shop serves light lunches delicious home-made cakes and Cornish cream teas. br / br / The bedrooms are light and airy and equipped with an emphasis on high quality and comfortable accommodation ensuring visitors have a wonderful relaxing haven from which to explore Cornwall. br / br / Each room has a radio hospitality tray television with integral dvd hair dryer and direct dial telephone with an alarm call facility. A selection of toiletries are provided and ironing facilities are also available. br / br / Rooms are freshened daily towels changed and your hospitality tray and mineral water replenished. br / br / Elerkey has a twin double and family room which can sleep up to four people. They all have central heating ideal for any season. The guest lounge overlooks the garden and patio area which are sun traps on lovely days guests may relax here any time. Parasols and cushions are always available. br / br / We are open throughout the year except Christmas and the New Year. br / br / Breakfast is served in the beautiful spacious dining room. An extensive menu is available offering a Traditional English Breakfast along with a substantial continental and vegetarian alternative. Everything is freshly prepared and cooked for you to enjoy using free range eggs fresh fruit and locally sourced food where possible. br / br / Morning Newspapers can be ordered. We can also arrange packed lunches picnic chairs and beach towels on request. Sandy beaches or lush gardens Our St Austell hotel is set near the centre of the bustling market town of St Austell close to the stunning bay and many of Cornwall s most popular attractions. A trip to the incredible Eden Project and the beautiful Lost Gardens of Heligan is a must-do and the coastline here is deservedly popular. After all that exploring enjoy a well-deserved pint at the nearby St Austell brewery. All rooms feature a comfy king size bed with four plump pillows and a cosy duvet. Our on-site restaurant and bar serves breakfast and tasty evening meals. Early/Late Check-In/Out Service if you re looking to make the most of your day we can offer an Early Check-In service from 12:00noon and a Late Check-Out Service until 2pm so you have more time to relax - cost is �10 per service per room subject to availability - bookable direct by telephoning the hotel. We are a pet friendly hotel and allow up to 2 domestic pets per stay. This is at an additional charge of �20 per pet per stay. Please contact LateRooms to arrange this to be added to your booking and for further details on charges and terms and conditions. Please note that Guide dogs Hearing dogs and other animals to aid disability are exempt from charge. 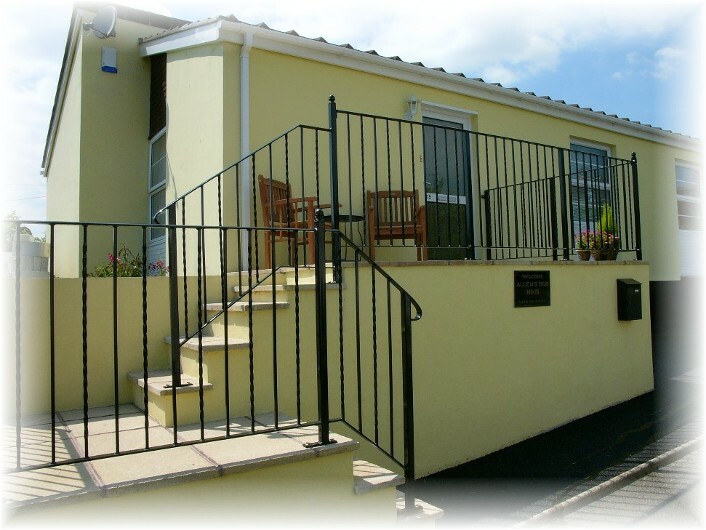 Bradleigh Lodge is a family run bed and breakfast situated in the heart of St Austell Cornwall. A perfect place to explore the Cornish country side. Our full Cornish breakfast is cooked fresh to order using only the best of local produce from the surrounding area. Each room is En-Suite and equipped with a Mira power shower free wifi tea and coffee making facilities and an outside smoking area if required.